Isaiah 26 is a song of praise, an expression of gratitude to God for what He has done for His people. 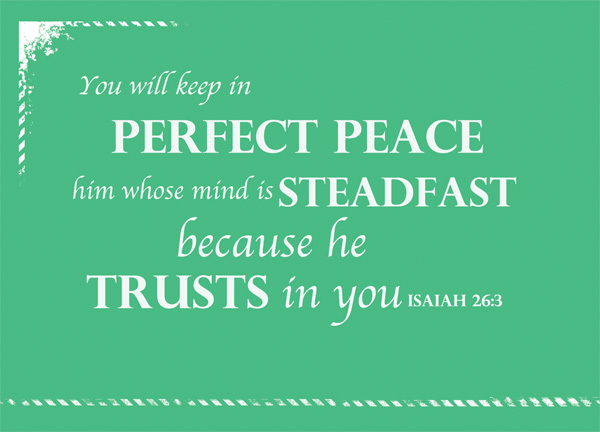 In Isaiah 26:3, Isaiah praises God for keeping in peace those who trust in him. Trusting in God is probably one of the most basic things to do or to learn how to do as a Christian, and it is one that we ought to be frequently reminded of – if not because we will forget, then because it is something that we can give thanks to God for – the ability to trust in him. In this study, we will examine the concept of Christian peace, and in the context of this verse, perfect peace, and how it is related to the very fundamental act of trusting in the Lord. because he trusts in you – Let’s work backwards for this verse. First, trust God. We know we’ve been asked to trust God, with all our hearts, even in conditions that are trying and in situations that are baffling. Trust in the Lord with all your heart and lean not on your own understanding [Proverbs 3:5]. If we trust God, we know we’ll be blessed [Psalm 40:4, Psalm 84:12] – But blessed is the man who trusts in the LORD, whose confidence is in him [Jer 17:7]. If we trust God, things will happen – Commit your way to the Lord; trust in him and he will do this: He will make your righteousness shine like the dawn, the justice of your cause like the noonday sun. [Psalm 37 5-6]. If we place our trust in him, we’ll generally have peace. Most importantly, perhaps, trusting God is something that a Christian must have and must do, no matter how long he has been in this faith, no matter whether a baby Christian or a matured Christian, no matter a lay Christian or a preacher of the word – So that your trust may be in the Lord, I teach you today, even you [Proverbs 22:19] – Trusting in God is something that we can never be reminded of frequently enough. him whose mind is steadfast – I don’t know about you, but personally, steadfast is not a word that I’ll use in my everyday life. I’ll say faithful, I’ll say committed, I’ll say unwavering – and while steadfast definitely isn’t a rare word, it’s not something I would use in everyday life or even in writing. Taking a look across the various translations, this has been rendered in various ways, from him whose mind has stayed on you, or dependent on you to him whose mind is focused on you etc. They have similar connotations, really, and that’s perhaps what steadfastness is really about – the complete devoted nature of your mind, heart and soul on something or someone. To have your mind fixed on God, to be so firm and sure and confident of God’s promises and his convenants, and of his precepts. I’ve always maintained that in order to have unwavering trust in God and his promises you need to first know what his promises are. You need to first understand, to a certain extent, what God is about and what his word is about. You need to at the very least, know his characteristics – that he fulfills his promises. He will deliver, for sure. That he is capable of delivering, because he is almighty. I find it hard to imagine how someone who doesn’t know that God is omnipotent is still able to trust God. He or she must be very blessed. I’m not saying that we cannot trust God or don’t need to trust God until we fully understand his precepts since we can never fully understand his precepts even if we exhaust our entire lifetimes, but at least, with whatever limited understanding of God that we have at our current points in life, let us learn to trust in him, with steadfastness. You will keep in perfect peace – What is perfect peace? In the original (Hebrew) version, the word perfect wasn’t used – apparently, the phrase was peace peace. I’m not familiar with the rules of the language, so it could be peace as an adjective and peace as a noun, ie. peaceful peace, or simply just a repetition of the word peace to show the extent of it. If the latter is true, the English translation of perfect peace would make sense. A peace that’s even more peaceful than the peace that we’ve been so familiar with. What is peace? Most people, whether Christian or not, would desire peace. If possible, we wouldn’t want to live in a war-torn nation. If possible, we wouldn’t want to stay with people who constantly seek conflicts and malicious arguments. Yet, the Christian peace is perhaps a peace that is all that the world knows of, and more. And the peace of God, which transcends all understanding, will guard your hearts and your minds in Christ Jesus [Philippians 4:7|Article]. We are entitled to this peace. We are promised this peace – Peace I leave with you; my peace I give you. I do not give to you as the world gives. Do not let your hearts be troubled and do not be afraid [John 14:27]. This peace is true, it’s real, it is substantial and solid, and it is significant, for it is perfect. It is complete. It is constant. It is abundant. Isaiah 26 is not a prayer of petition, or a cry of hope, but a song of thanksgiving and praise. When Isaiah said, You will keep in perfect peace him whose mind is steadfast, because he trusts in you, he didn’t say it as a request, but he said it as something that has been done, and will always be done. He said it as thanksgiving. We may not feel like we have perfect peace right now. We may not even understand what is perfect peace and how it feels like. After all, it’s supposed to transcend all understanding. But by keeping our trust in God and staying steadfast in that trust, surely, as he had promised, that perfect peace is already here. …but at least, with whatever limited understanding of God that we have at our current points in life, let us learn to trust in him, with steadfastness.